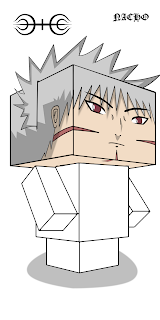 This Naruto papercraft is the Tobirama Senju, the cube craft paper toy is designed by blackignus. Tobirama Senju was the Second Hokage of Konohagakure. He hails from the Senju clan, who along with the Uchiha clan, founded the first shinobi village: Konoha. During his reign, Tobirama was accredited as the Hokage that developed the village’s infrastructure and organisational system.